The last week had been one of those: do-a-lot-of-work but see-little-progress kinda times. Patching walls, cleaning, varnishing floors. You know, essential, but not as rewarding. But - yesterday we moved the first piece of equipment into the space. The four coats of varnish have dried and I found this wonderful drying rack for about 20% of it's original cost, gotta love Kijiji! Next I move the presses! I was really overwhelmed when the drying rack arrived. 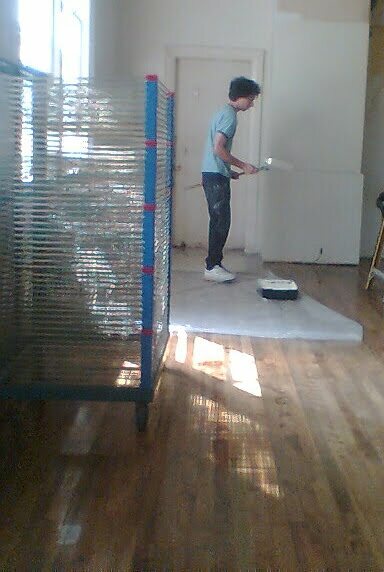 For the first time I was hit with a sense of "it's really going to happen"
By the way, that's Max Lupo (ruggedly handsome studio assistant - his words) in the photo, painting the walls.